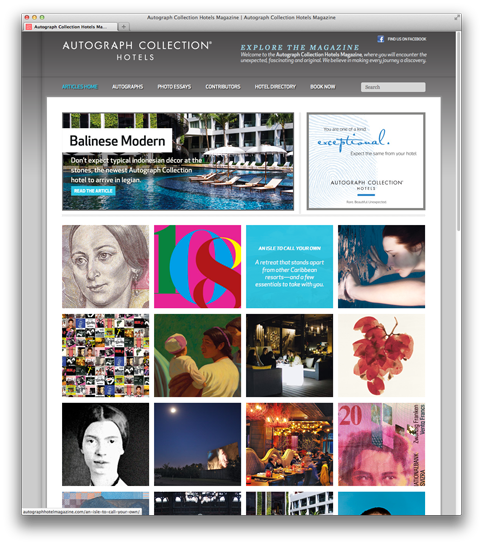 The Challenge: To create a companion web site to the luxury hotel collection’s printed magazine. The general interest e-publication needed to appeal to guests (and would-be guests) and integrate social sharing to build engagement among the hospitality company’s target demographic. The Result: We successfully met the challenges head-on by strategically incorporating all of the beautiful photography from the printed piece into the website; bringing written content to life with a clean, elegant design; and facilitating social interactivity by using strategically placed drivers to Facebook and Twitter.